Inventory We are a resale marketplace, not a box office or venue. Ticket prices may exceed face value. This site is not owned by Berglund Center . 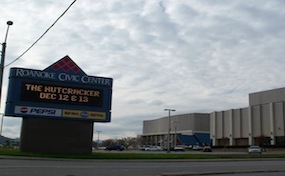 The Berglund Center, formerly the Roanoke Civic Center, is the premier spot in the Roanoke, Virginia area to catch the hottest touring performers. The Berglund Center box office was home to many now defunct franchises like the Virginia Squires, Roanoke Express, Roanoke Dazzle, and Roanoke Valley Vipers. Currently all of Virginia Tech men's hockey team home games are at the venue. The Berglund Center has a maximum capacity of 10,600 for center-stage concerts and is normally 8,642 for hockey. Some of the hottest most recent Berglund Center tickets have included Carrie Underwood, Hank Williams Jr, James Taylor, Liza Minnelli, Brad Paisley, Jason Aldean, and even hosted the great Elvis Presley in 1974. CenterRoanoke.com is a privately owned and operated company that specializes in offering low prices and a vast selection of inventory online for all secondary market events. We are not affiliated with any primary supplier, website, or box office. Online prices can fluctuate below or above face value and will change with the market. To purchase tickets for all Berglund Center events simply click on the event of interest or pick up your phone and call our operators who are standing by at anytime.